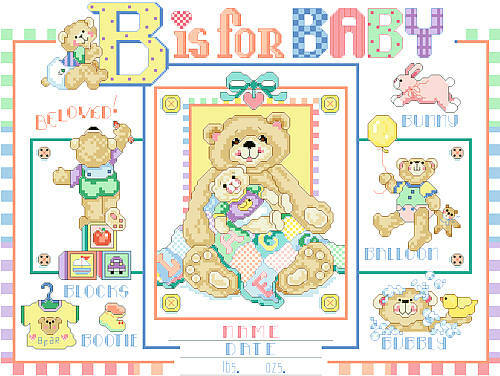 'B' For Baby's Birth Announcement! 'B'eloved 'B'aby wears 'B'ooties; chases 'B'unnies; plays with 'B'alloons; 'B'locks and 'B'ears; and 'B'ears take a 'B'ath of 'B'ubbles. Contents: Stitch Count 173w X 130h. Finished size on 14-ct 12-1/4" X 9-1/4"